My laptop is reaching the end of it’s lifespan and no amount of reformatting will do anything to save it. It has turned on me Bd now I must rely on my friend iPod to talk with you all this evening. For easy transport back. There’s not actully that much…or it just doesn’t take up a lot of space. The weather is starting to cool down noticeably, but still not cold enough for snow, only rain. The work out front and back continues. If I can manage some sort of truce with my laptop I might Bd able to post some pictures to show you. There’s a lot of mud, which makes it hard to keep it clean inside. Well, tomorrow is s very busy day getting everything dine fir the weekend so I should really get to bed. Don’t want to fall asleep on the job! On another note we finished the first season of The Event. Interesting. Today made me think of history class. All the mud. Think WWI, Passendale and Ypres. If my research is right this village and city are in the West Flanders province in the north (Flemmish) part of Belgium. Let me back up a bit. 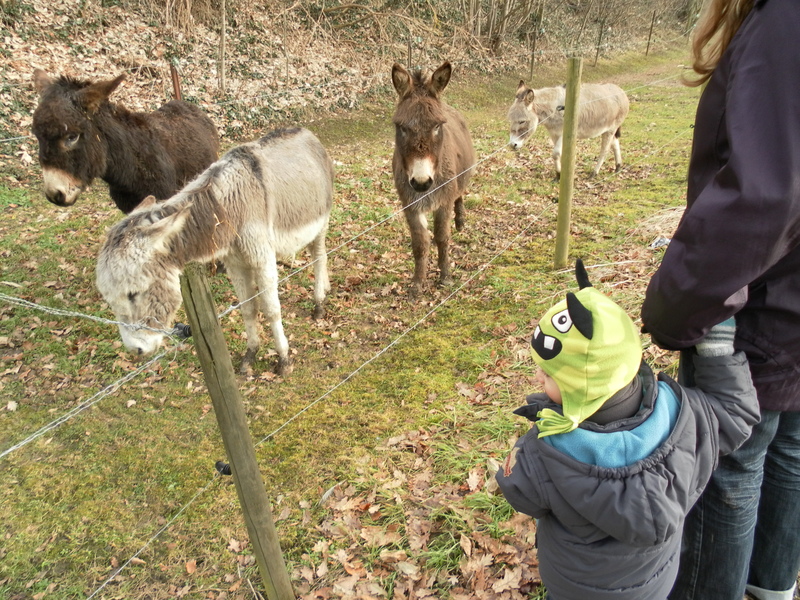 This morning Adeline, Bastien, Sylvain, and I went for a walk. 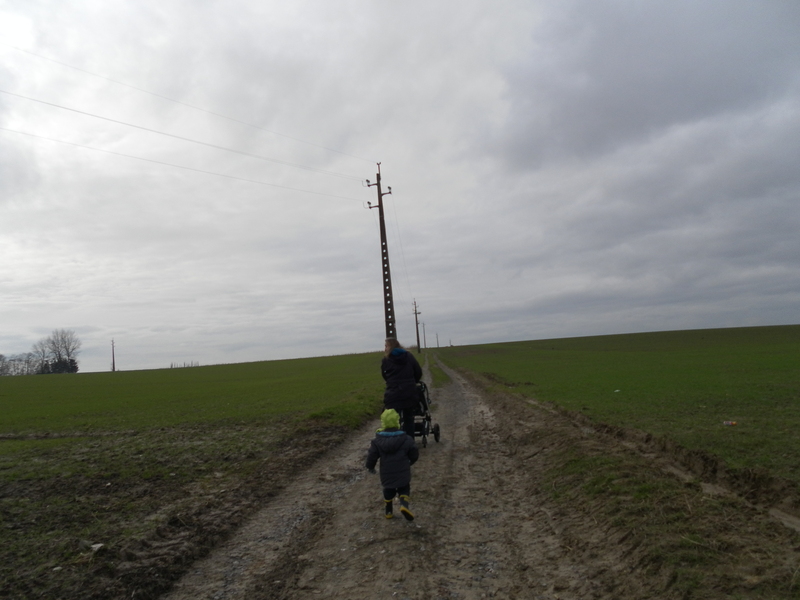 A long walk. Adeline has this booklet made of routes we could walk…some are from the house, others aren’t. They range from a couple of kilometers to several! The one we did today was about 3 I think? I’ll have to check with Adeline tomorrow, but I think it was between 2 and 3. 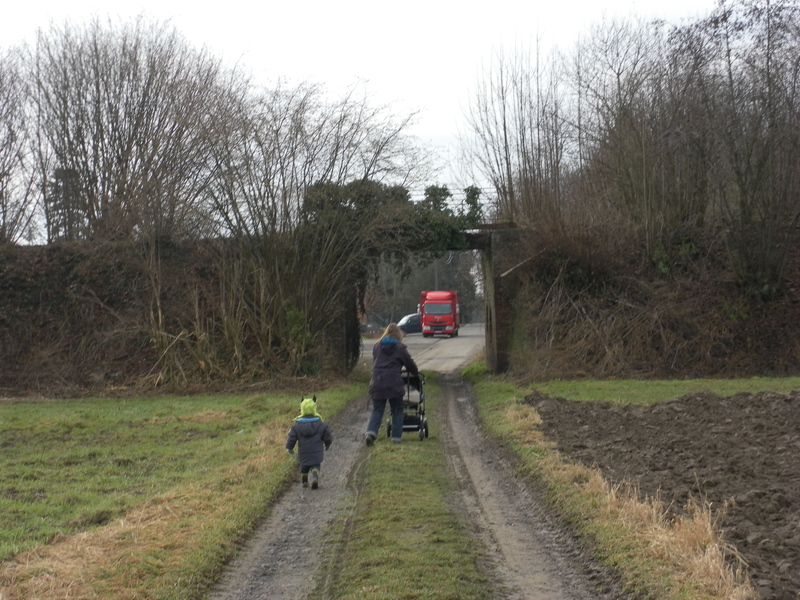 We walked along back roads so there wasn’t much traffic (which was really nice, because at home I don’t really have that option – meaning they may be back roads, but they’re gravel so not as nice, and there’s more traffic). 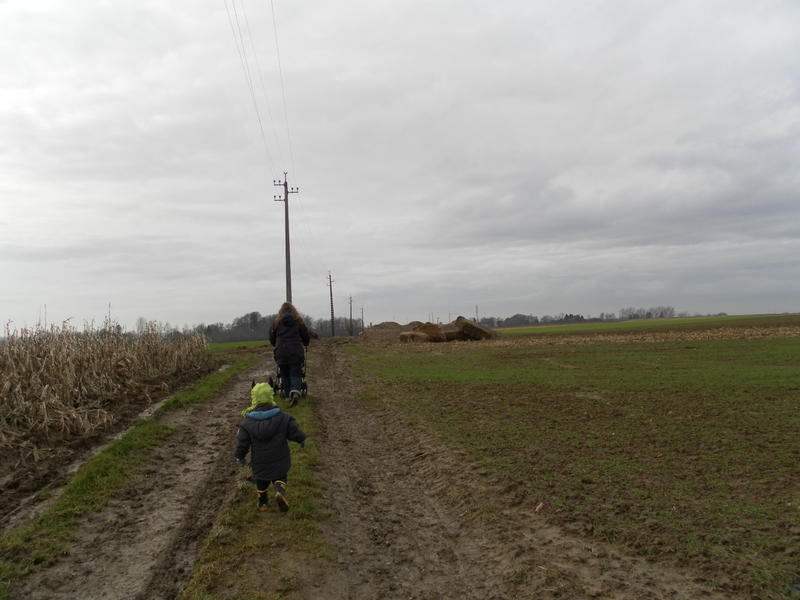 To make the trek shorter, we used this dirt (mud) road through 2 fields…a tractor road. 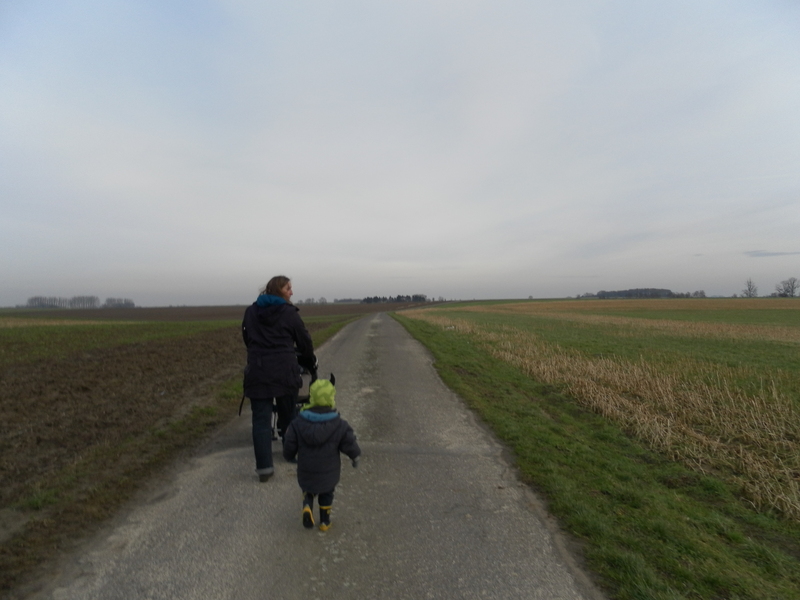 It wasn’t bad walking in the center where there was grass, but as it was Bastien had to walk because I wouldn’t have been able to push the stroller with him in it! 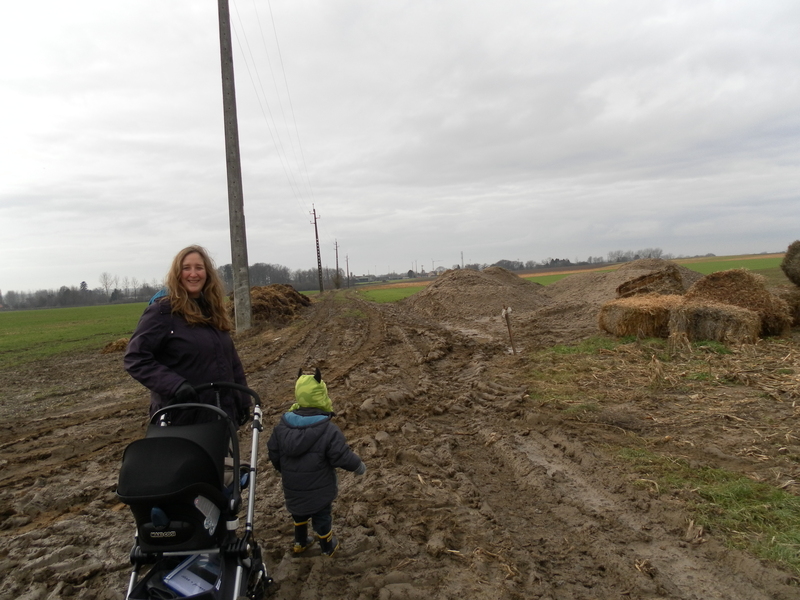 We got to this section that was all mud and we had to carry the strollers one at a time through it. This was part of what made me think of WWI. Kind of a downer, but really I was just in the mindset that I’m in a country that has so much more history than mine. Of course WWI wasn’t that long ago in the grand scheme of things, but still, in general Belgium has much more recorded history than Canada. I may not be a history buff (like some of my friends ^_^), but I still find it interesting on occasion :D.
Today was also the day of French class #2. We talked more about the calendar and we talked about writing a C.V. (a résumé and I have to write one for next class). We also went through each month and what veggies and fruits were in season. The calendars she gave us were from a grocery store. Did you know there was such a thing as white asparagus? I didn’t. But my teacher said they are special to Belgium and you can only get them in May. Or something like that. But I guess you can get them in jars anywhere. I also was able to give 3 of my classmates a ride home. That way they could stay for the whole class and not have to take the bus! Today is a good day to have a baby. Adeline’s brother and his wife, and friends of Adeline and Greg both had their babies today! That being said, I love babies. Even though Sylvain cries a lot, he is very adorable. He’s starting to make the cutest noises and you just know he’s having a conversation with you (if only we could speak their language…). Also, he’s playing around with facial expressions, and his smiles are very welcome. Basically, I feel like sunshine and rainbows when he coos and smiles. I know its super cheesy, but it’s true, you can’t help but feel amazing when a baby smiles at you!